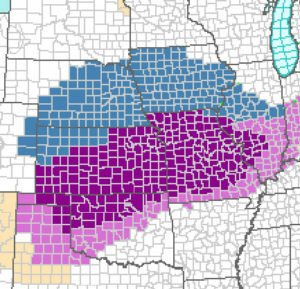 The blue areas of this NWS map indicate a Winter Storm Watch, while the purple areas are warnings for freezing rain and ice. 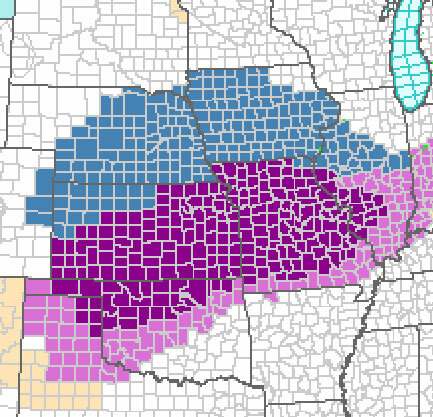 A massive winter storm system that stretches 1,000 miles from the Great Plains to the Mid-Atlantic states threatens to coat a wide section of Iowa with a layer of ice later this weekend. Meteorologist Kurt Kotenberg, at the National Weather Service bureau in metro Des Moines, says most of the state is now under a Winter Storm Watch. Since temperatures will be hovering around the freezing mark, much of the precipitation may fall as rain or freezing rain but likely -not- as snow, though parts of northern Iowa (north of Highway 20) may see an inch or so of snow. He predicts ice will cause the most trouble with this storm. Thick ice can build up on tree limbs, causing them to break and fall on power lines, bringing outages. If you have a generator, gas it up, as electric outages could be widespread. The commute to start the week could very well be a mess. On the plus side, winds are forecast to be very light, only 5 to 10 miles-an-hour, so it’s not likely there will be a lot of galloping, snapping power lines nor will wind chills be extreme.